Your Outcome: Create space in your life to renew and recharge. By setting boundaries and buffers, you set yourself up for sustainable results and you take a significant step toward mastering your work-life balance. Welcome to day 7 of 30 Days of Getting Results. In day 6, we learned how to use Friday Reflection to skillfully take a look at what’s going well and what to improve. Today, I had to ask myself, what’s the most useful nugget I can share with you at this stage? I think the answer is — setting boundaries and buffers. This is how you create space in your life and make time for what’s important. It’s at the heart of finding your peaceful calm and finding your flow. 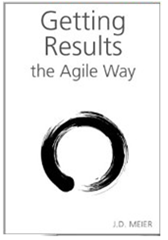 Agile Results is a system that can support you the rest of your life, no matter what you do. I use it for shipping stuff at Microsoft, leading teams, writing books, learning, etc. The beauty though, is not just that it’s simple, or that it’s proven … it’s that each day you get a new chance at bat – a fresh start. Each day you wake up is another chance to ask the question, “What are three things you want for today?” … and so you write your story forward. Now then, on to setting up boundaries and buffers. If you can master this, it’s THE key to work-life balance, and it’s how you can get more done, in less time, with more energy, and it’s how you can find your flow. If you feel overwhelmed by too much to do, and not enough time, buffers and boundaries will set you free. At the end of the day, it’s about knowing what you ultimately want and balancing your competing wants and needs against that. Keep this in mind — you have to Protect yourself – and boundaries and buffers are your friend. Nobody will set effective boundaries for you, and you know the most about yourself better than anyone. This is the ultimate care and feeding of yourself, which sets the stage for everything you do. Note that you have to set your own boundaries that work for you. This is just an example of how some people have found a way to perform well at work, spend more quality time with those they love, invest in their body, and find a way to spend time on their passions again … and remember that one person’s minimum is another person’s maximum. Stepping back, I can tell you that the most important pattern I’ve seen across people that get more of what they want from life, is that they fix time for eating, sleeping, and working out – and everything else fits around that. They never rob themselves here – it’s their foundation and platform for all results in their life. You can only spread your life force over so much. The categories support each other. When you set a minimum in the right categories, you avoid getting unbalanced and improving other categories. When you set a maximum in the right categories, you learn how to become more effective. For example, if you only have 8 hours to throw at your day, you’ll use them wisely. The worst mistake it to throw more time at problems. The key is to reduce time spent, while increasing value and improving effectiveness/efficiency. So step one is deciding to spend no more than 50 hours each week at work. Now it forces you to bite off only what you can chew. This is how you start improving plate management and pushing back effectively. It’s the simplest way to avoid spending $20 on $5 problems. One of my most important lessons is that the best way to set boundaries is to use time. Treat time as a first class citizen. It’s pretty reliable too – each day you get 24 hours. Each week you get 7 days or 168 hours. And the cycle repeats itself, each day, each week. So if you can master your day, you can master your week – and looking at your time from a weekly standpoint helps you establish a schedule that works for you. I used to be very “scope-driven.” I wanted to change the world. The problem is that when you drive from scope, you often run out of time, then you have to cut corners you don’t want to cut. Worse, you often push past your boundaries (“I’ll eat lunch later”, or “I’ll stay up later to finish this one last thing”, or “I can’t take a break now,” etc. Worse, when you don’t respect time, not only do you throw time at problems and re-enforce bad habits … you miss windows of opportunity. I’ve found that a stitch in time actually saves way more than nine … and that it’s the key to effective results. This is a key shift from it’s done when it’s done or it takes as long as it takes, to how much time do you have for it and how much time is worth spending on that and how much is too much time to spend on that? One way to think about this is that time is a budget, just like your money. You only have so much. You can spend it wisely, or you can let it rule you, or you can waste it. Time is a unique resource that you don’t get back and choosing how you spend your discretionary time is what ultimately changes your life. If you want to spend more time in something, then make more time for something. The way to do so is to set smart limits on the things you know you need to do. Trade your time by design vs. by default. Choose an area in your life that’s not working for you and try setting a new limit. This might mean setting a maximum amount of time in something, or a minimum amount of time in something else. Find one simple way to add space in your life and take it for a test drive next week.